On Monday, May 21, 2018, the issue of later school start times came up again at the Lower Merion School Board meeting, as two seniors, Melanie Metz and Ben Feldman, addressed a packed audience which stretched to overflow capacity. They expressed concerns about the health effects of insufficient sleep related to current start times, and the need to take corrective action sooner rather than later. 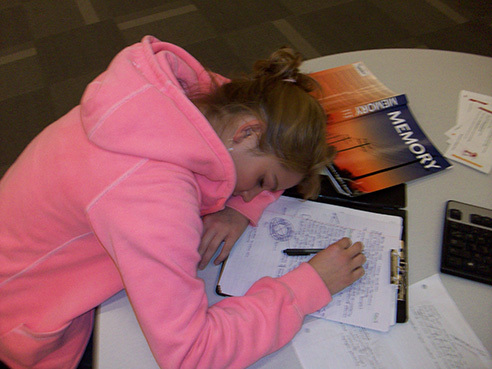 While the Board faces other issues, including enrollment growth and teacher contracts, Metz felt that school start times have a “relatively straightforward fix.” Historically, though, the Board has filed this issue in a drawer called, “does not require immediate attention.” However, Metz insists that sleep deprivation needs prompt attention and has been afflicting students for years. Dr. Catherine Schrand, Professor of Accounting and Vice Dean of Wharton Doctoral Programs at the University of Pennsylvania and a Lower Merion resident and parent, attended a meeting of the LMSB in fall 2017 where the issue of school start times was discussed. She affirms that the District’s proposal to continue to study the issue could take years, yield no solution, and tell us what we already know: that change will indeed present challenges to work through. Any logistical problems would not be insurmountable hurdles, she says, but rather “hiccups” that can be readily overcome. If, as Ms. Metz claimed on Monday, the “fix” is straightforward, then why haven’t we moved forward in 20 years? Feldman brought attention to the large gaps in knowledge about sleep health that persist in our community. He cited the WIA Optimal Club survey from earlier in the year, which revealed that 60% of responders didn’t know how much sleep they should be getting and that the average student gets 51 minutes less than the recommended minimum sleep (8 to 10 hours per night). Dr. Schrand argues that the lack of information and misinformation about sleep in the community are the major bottlenecks to implementing the change. This lack of awareness, along with unsubstantiated concerns that bus and sports schedules cannot be reconciled, has contributed to the absence of a united stand for change. One parent who has spent five years advocating for later start times for LMSD is Amy Norr, former president of the Interschool Council (ISC). In 2015, Norr, along with three other parents on the LMSD ISC, interviewed over two dozen LMSD administrators about the challenges of changing school start times. Norr found that the biggest challenge was transportation: LMSD has a three-tiered busing schedule (high school, then middle, then elementary), rather than a simpler one- or two-tiered system, and thus requires more bus runs. Another complication is the fact that school levels have varying durations of instructional hours. Modifying school schedules so that all three school levels have an equal number of student hours (which is possible despite state requirements for school hours) can simplify the system. School districts that have made the change used outside consultants to successfully re-organize bus routes to maximize efficiency, considering a various scenarios before selecting the best options. In fact, some schools found that the exploration helped them find new routes which actually saved the districts money, according to Start School Later, Inc. Indeed, concerns about athletic schedules, along with costs of additional buses, are among the top concerns voiced by parents and students. However, these concerns were not shared by LMSD athletic directors who were interviewed by Norr’s team. “I think the decision-making in this case suffers from a problem that affects many investment decisions,” says Dr. Schrand. While “local costs,” such as more buses and drivers and new playing field lights can be estimated with a fair degree of precision, the “local benefits” cannot. “How does one measure the number of traffic accidents that are prevented or the number of prevented suicides or the number of children who don’t become drug addicts after taking drugs to stay awake during high school?” she points out. In fact, large-sample studies have shown that we will prevent traffic accidents, and suicides, and stress, and illness by starting schools later. A RAND report published in 2017 shows that investment in additional buses can be profitable because of reduced teen driving accidents, and from graduates earning higher wages by finishing school and achieving better grades. With such communication, Schrand believes, LMSD parents will want to work through the transition. By equipping residents with information about the health, safety and other benefits of sleep, a community can eventually agree with the ultimate goal, and accept the “hiccups” associated with the transition process. Change may be too late to benefit those who have advocated for it, including Feldman and Metz, but they are hopeful that later start times will become a reality in the near future, and will benefit generations of students to come. This is the third article on the issue of sleep in LMSD students and school start times. Other articles include one published by Melanie Metz and one by Anya Jayanthi.